Publisher Kaveh Mojtabai photographs Artscope Magazine's new intern, Olivia, with artist Paul Pedulla, at studio 314, 450 Harrison Ave, Boston, during First Friday Open Studios. The Guild encourages visitors to take a break from the cold and visit the sunny studio of Paul Pedulla during First Friday Open Studios, 5-9 pm, February 1, 2019. Colleen Martin of The Heights, Boston College's independent newspaper, visits Paul Pedulla and other artists at 450 Harrison Ave, Boston, during the "Artists in Their Studios" event. Lawrence Ferrara interviews artist Paul Pedulla about his work, how it affects viewers and how art and health are related. Artscope Magazine publisher Kaveh Mojtabai and artist Paul Pedulla perusing the exhibited work at Art Basel Miami Beach. Paul Pedulla and his work at First Friday Open Studios, October 5, 2018, in a video created by Managing Editor Brian Goslow. Managing Editor Brian Goslow shoots a quick video of Paul Pedulla and his work at First Friday Open Studios, October 5, 2018. Closeup of Paul Pedulla and painting "Line in the Sand" at 450 Harrison Ave, studio 314, Boston. Photo taken by Managing Editor Brian Goslow at First Friday Open Studios on June 1, 2018. Managing Editor Brian Goslow visits and photographs Paul Pedulla and other SoWa artists at First Friday Open Studios. Boston Voyager Magazine interviews Paul Pedulla about his work and background. Paul Pedulla is photographed with artists Ardis Tennyson-Loiselle and Marsal Nazary at ARTRAGEOUS!32, an art auction to benefit Montserrat College of Art, Beverly, Massachusetts. Dibby Flint Design of Milton, Massachusetts and Kennebunkport, Maine assembles an imaginary dream dining room that features the painting PORTHOLE II by Paul Pedulla. The artist agreed to be in a three-minute documentary by Lawrence Ferrara for a University of Massachusetts Boston class project. Artscope Managing Editor Brian Goslow shoots a video of artist Paul Pedulla being interviewed by writer Suzanne Volmer at 450 Harrison Ave, studio 314, Boston, during South End Open Studios. Gallery photo of artist Paul Pedulla at the opening reception of his new show. Artscope Magazine's Instagram post calls out Paul Pedulla's JETTY in the "Wall" Show at Alden Gallery in Provincetown, Massachusetts. A photo detail of the painting is featured. Dianne Sherratt-Steimel from CTM TV (Chelmsford, Massachusetts) interviews artist Paul Pedulla about the CCA in Bloom Gala and the idea of matching art with floral interpretations. Publisher Kaveh Mojtabai visits Paul Pedulla at 450 Harrison Ave, Boston, and snaps a photo with the artist and his latest work titled "Sandbox." A fashion shoot at 450 Harrison Ave, Boston, by "The Buzz" Magazine includes paintings by Paul Pedulla in studio 314. The story is titled "Art & Fashion" and the theme is "artistic expression as a creative force." Z list creator Dacey Zouzas photographs and chats with artist Paul Pedulla and others at the CCA in Bloom Gala in Chelmsford, Massachusetts on April 2, 2017. Reporter Jolin Cheng interviews Paul Pedulla and five other artists in the SoWa Artists Guild at Salon Sunday Open Studios, 450 Harrison Ave, Boston, on March 26, 2017, for the weekly show, "You are Here." Publisher Kaveh Mojtabai visits studio 314 at 450 Harrison Ave, Boston, on First Friday and takes a photo of Peter Bradley Cohen and Paul Pedulla. Publisher Kaveh Mojtabai chats with reporter Tanner Stening of The Boston Guardian and artists Paul Pedulla and Wendy Shapiro at the United South End Artists 30th anniversary party. Photo by Leigh Wyman of Artscope Magazine. At "Discover Quincy's Art Walk Friday," Publisher Kaveh Mojtabai captures a photo of Paul Pedulla (artist in residence at Artscope Headquarters for the evening) and two other visiting artists. Managing Editor Brian Goslow captures a photo of "Green Shade Neighbors" and Through the Dunes" by Paul Pedulla in a post promoting the "Meme" show at Alden Gallery in Provincetown, Massachusetts. New York designer Lee Owens features Paul Pedulla's "Pink Cottage" from serenaandlily.com in her imaginary dream room. Artist/Blogger Paula Ogier visits and photographs Paul Pedulla and Peter Bradley Cohen during their "Clean Cut" show at 450 Harrison Avenue in Boston's South End. Publisher Kaveh Mojtabai visits the "Clean Cut" show at 450 Harrison Ave, studio 314, Boston, on First Friday April. The Boston Calendar features the painting "Green Screen Door" by Paul Pedulla in an event promotion for the SoWa Artists Guild's "Salon Sunday," March 20th. In IM Boston's interview with Paul Pedulla, the artist answers a few questions for readers. Nice feature photo of painting "Beachfront Gambrel" and story about the "Making Meaning" show at Drift Gallery, Portsmouth, New Hampshire. In this story about the top events in Portsmouth this weekend, images of Boz Scaggs and Paul Pedulla's "Beachfront Gambrel" appear. A description of the "Making Meaning" show at Drift Gallery follows. Drift Gallery presents "Making Meaning"
Paul Pedulla's "Beachfront Gambrel" is the featured painting in this story about the "Making Meaning" show at Drift Contemporary Art Gallery. Meredith Goldstein of The Boston Globe mentions Alden Gallery's "Square" show and works by Paul Pedulla and other gallery artists. HGTV host and designer/stylist Emily Henderson highlights SerenaandLily.com and singles out "Across the Bay" by Paul Pedulla in her story about the "Best Sources for Art Online." In his story about the 20 best places to buy art online, writer Peter Dolkas singles out Paul Pedulla's "Beachfront Gambrel" from Serena & Lily. Highlights and photos of Paul Pedulla's Alden Gallery show. June Wulff of The Boston Globe chooses Paul Pedulla's Alden Gallery exhibit for Wednesday's (July 30th) Pick of the Day. Provincetown Banner announces Paul Pedulla's new show at Alden Gallery. Paul Pedulla demo and talk at CCA. San Francisco Luxury Living (SFluxe) features Paul Pedulla's painting "Green Shade Next Door" in a story by Damion Matthews announcing the opening of Serena & Lily's Design Center in San Francisco. Blog includes Paul Pedulla's "Beach Buddies" in a home interiors collection. Paul Pedulla joins five other artists and host Tom Christiano in a special television show. Writer Cole Tracy revisits Paul Pedulla, his latest accomplishments and works. An image of "Beach Buddies" is featured. In this feature story, Molly Loughman interviews Paul Pedulla and writes about his background and his Chelmsford Library show. 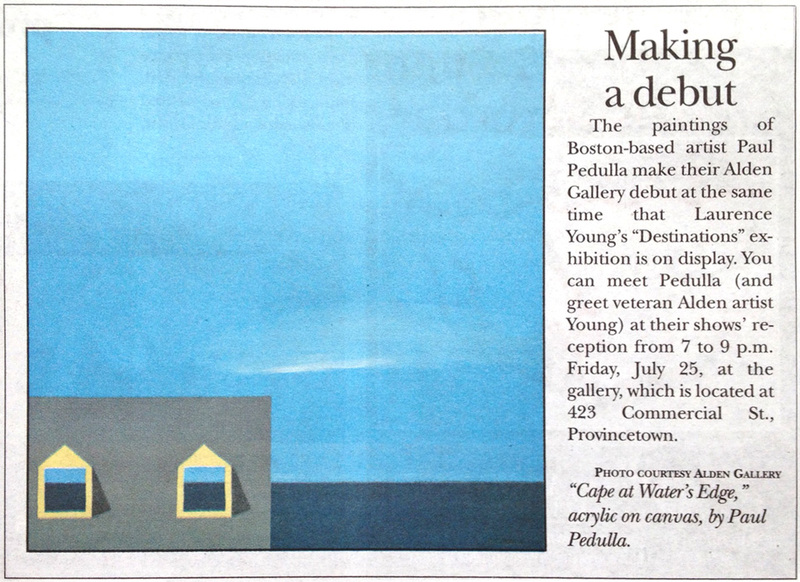 Wendy Killeen of The Boston Globe announces Paul Pedulla's Chelmsford Library show, features his painting "Ocean Edge." About the artist and a preview of his upcoming Chelmsford Library show. Artist/Blogger Mae Chevrette visits and photographs Paul Pedulla at 450 Harrison Avenue in Boston's South End. Writer/Photographer Robert Castagna interviews Paul Pedulla in a Q&A format with photos. Photo of the artist in his Inman Square studio. Blog: Ana's thoughts on design, entertaining and travel. Ana Donohue features Paul Pedulla's work at Tao Water Gallery, Provincetown, Massachusetts. Brian Goslow on Paul Pedulla: feature story. Managing Editor Brian Goslow describes meeting Paul Pedulla at Boston's South End Open Studios. FLUX Boston promotes SoWa First Fridays with an image of Paul Pedulla's "Dormer with Green Shade." Designer Ana Donohue describes the artist's work and features four of his paintings. Managing Editor Brian Goslow describes the artist's painting "Sentinels Slice" in Heartwood College of Art's juried show "The Sentinels of Parson's Beach." Photo of painting in print edition.